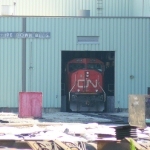 Description: CN hotshot heading south. The Rio Grande units were picked up at Pokegama Yard. 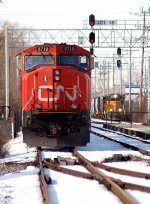 Title: Meet at Saunders on the CN Superior Sub. Description: Q118 meets the CN's 0600 transfer with the up power. Description: 930 rolls downgrade into Bingahmton with the Amtrak special right behind it. Description: Asortment of pics from different power and trains that run on the D&H...w/ a D&H as its center piece. Pretty much Old to New. Description: It may look like one entire train, but actually the GTW is helping the CN units pull NB train A431 into Decatur. And the coal train is headed northbound out of Decatur. Description: CN train 399 takes the connection track at Griffith, passing the historic Griffith Tower and EJ&E equipment on display nearby. Description: CN train M30271 (Memphis, TN to Baton Rouge, LA) arrives in Baton Rouge on the Hammond Sub. Wisconsin Central switcher 1569 is back in consist again. It was seen headed to Baton Rouge on the same train two weeks earlier. Description: CN train M30271 (Memphis, TN to Baton Rouge, LA) arrives in Baton Rouge on the Hammond Sub. Description: CN 5719 leads a northbound into Shops on a cloudy morning.